At Culture nights in Reykjavik the 23rd of august 2014 I was walking downtown with my recording gear. Reykjavik downtown was packed with people walking between events everywhere, in the streets, in galleries, restaurants, pubs and shops. I spent most of the day with AudioTechnica BP4025 on boom until I noticed that the sound was probably not as good as expected for music events. So I cycled home and changed to recently made „MKH20 binaural array„, hoping that it would give a better result. What interested me most was the six hour event in Hallgrímskirkja church. It was a music event with choirs, organ, sing along and many other kind of music. I spent almost two hours there recording to the end of the event. The last one was the choir Schola cantorum. This choir have beautiful voices and that evening they mostly sang hymn songs and prayers, some very old. Even though I am completely nonreligious, their prayers and songs touched me deeply . It somehow reminded my all in one, of my childhood, the beautiful nature and the wonders of life . As in a field recording this recording has its own character with average quality. But honestly, it is the most beautiful music I have ever recorded. I was probably 15 meters from the choir. People walked trough the church siting down and listening for a while, then walking away all the time so you will hear lot of cloth rustling. Outside there was a huge downtown street party which can be heard during the last minutes of the last song when the side doors of the church was opened. Quality headphones are recommended while listening. 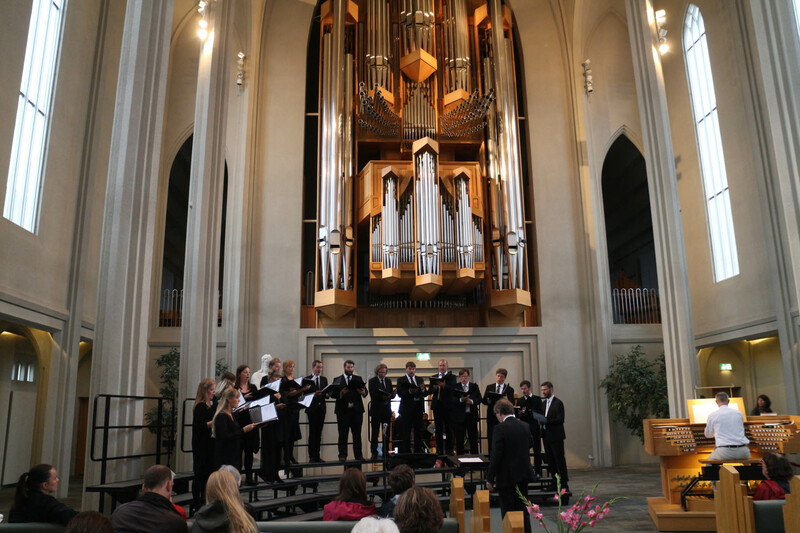 Hér er á ferðinni upptaka sem tekin var upp á Menningarnótt 23. ágúst 2014 í Hallgrimskirkju. Þennan dag stóð þar yfir 6 tíma dagskrá sem kölluð var Sálmafoss, þar sem ýmsir flytendur komu fram. Í lokin kom fram kórinn Schola cantorum undir stjórn Harðar Áskelssonar með sálmalög og bænir. 1. „Heyr himna smiður„. Sálmur eftir Kolbein Tumason (1173-1208) . Lag eftir Þorkel Sigurbjörnsson (1938-2013). 2. „Til þín, Drottinn hnatta og heima“. Sálmur eftir Pál V. G. Kolka (1895-1971). Lag eftir Þorkel Sigurbjörnsson (1938-2013). 3. „Vertu guð faðir faðir minn„. Sálmur eftir Hallgrím Pétursson (1614-1674). Lag eftir Jakob Tryggvason (1907-1999). 4. „Nú hverfur sól í haf„. Sálmur eftir Sigurbjörn Einarsson (1911-2008). Lag eftir Þorkel Sigurbjörsson (1938-2013). „Nú hverfur sól í haf“ er svo endurtekið eftir að Sr. Jón Dalbú Hróbjartsson sóknarprestur fer með bænina „Faðir vor“, en þá gengur kórinn einn hring um kirkjuna og endar sönginn frammi í andyri. Á meðan á því stendur eru dyr kikjuskipsins opnaðar, en þá má heyra í því villta partýi sem fyrir utan var. Upptakan er birt með leyfi kórsins. Mælt er með því að hlusta á þessa upptöku í góðum heyrnartólum.